It’s a new year! 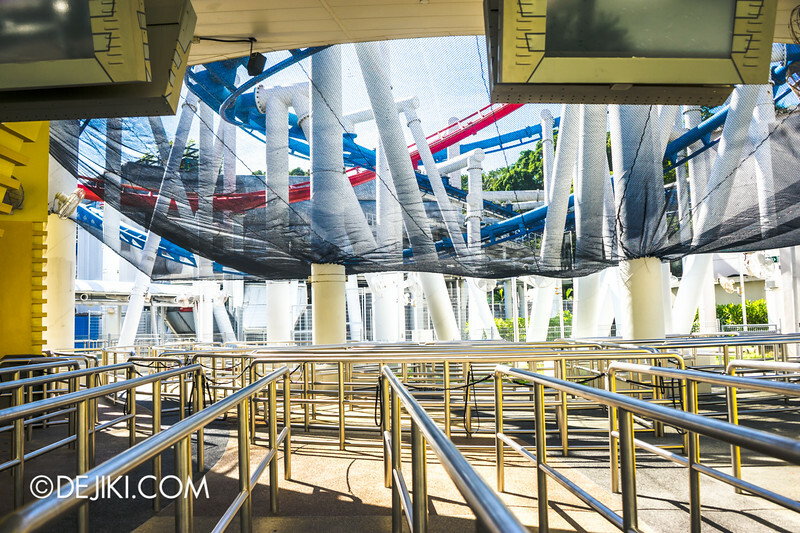 We’re back at Universal Studios Singapore to catch up on the latest happenings. 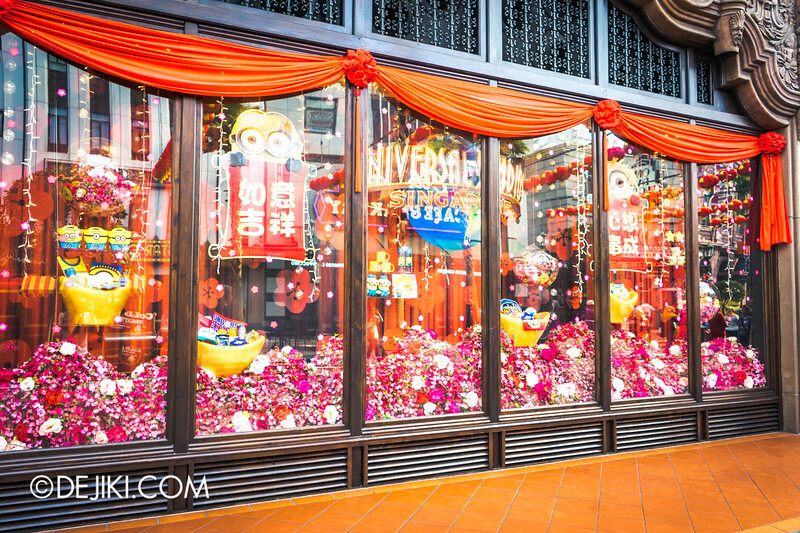 Find out about the festive decorations for Lunar New Year and news on the park’s attractions in the first park update of 2015! Over at Puss in Boots’ Giant Journey: It looks like the Tower structure is nearly complete. The section that faces the guest area of the park, that is. 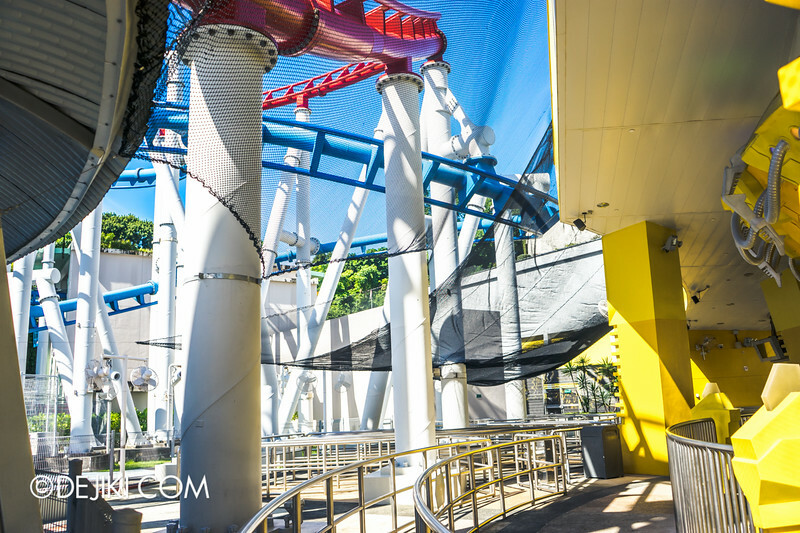 We now have a video of the suspended ride vehicle making its rounds along the track! The ride is undergoing technical tests. 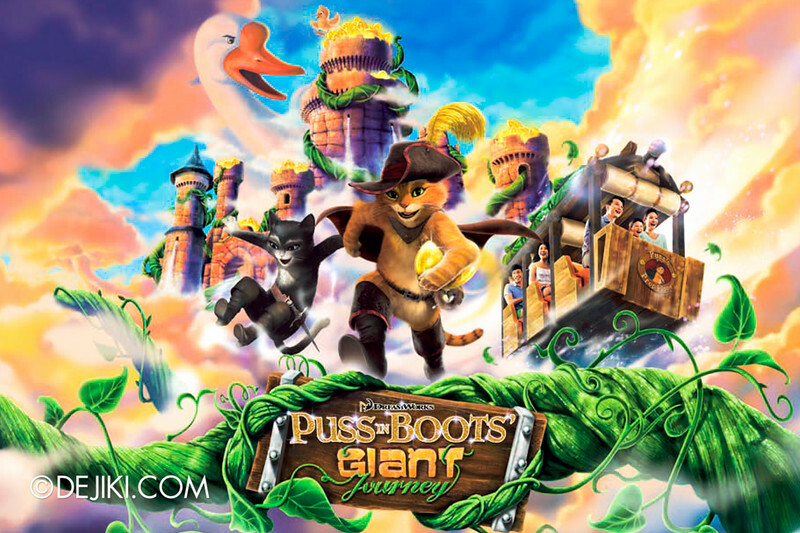 The park targets to open Puss in Boots’ Giant Journey in early 2015. The ride vehicle is designed to look like some sort of cart used by Puss in Boots to steal golden eggs from the Great Terror (Giant Goose). 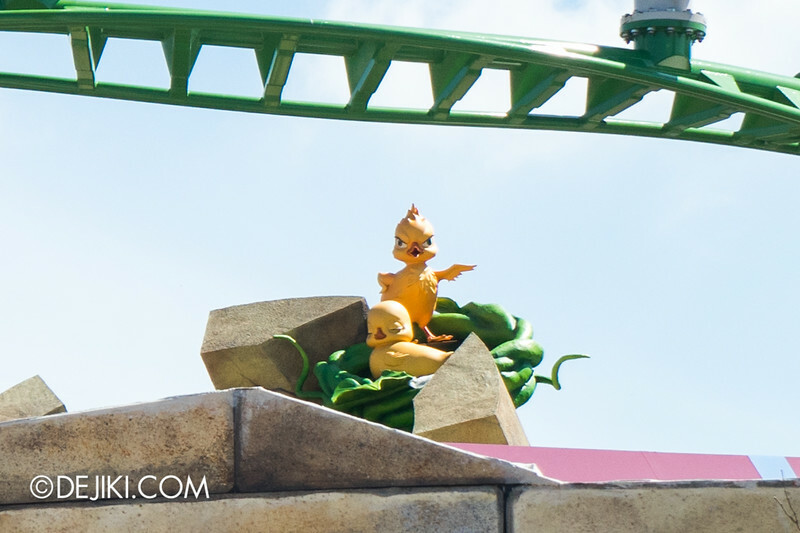 Anyway, the ride vehicles (the cart) have golden eggs in them at the back, which suggests that the ride’s narrative would pick up from there… and be something along the lines of a great escape. A recently released concept art shows that the towers will be overflowing with golden eggs. It also reveals the ride vehicle – 3 rows, seating 2-3 guests per row. 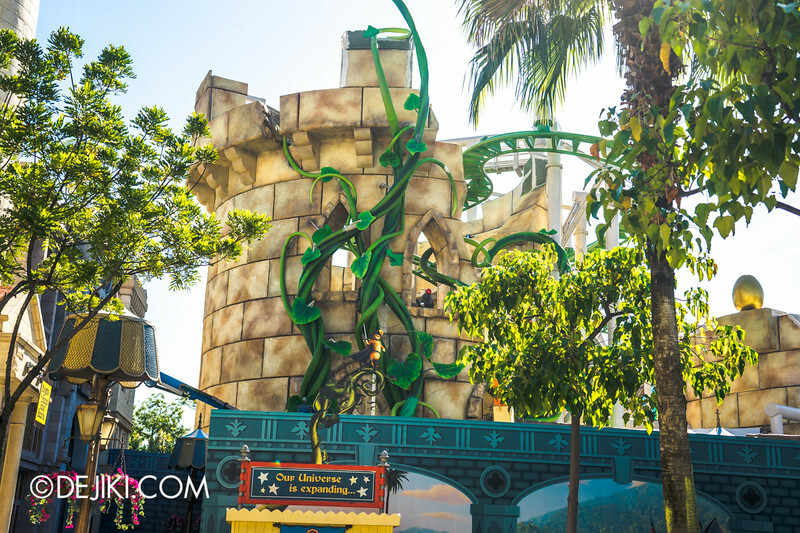 Some finishing touches are being done to the beanstalk vines, and it looks like workers are also installing some lights inside the tower. We should be seeing the near-final colour of the decorative structures. Has anyone ever noticed the exaggerated scale of the bricks used at this attraction? It’s an old trick in the book – and I’m quite curious how the effect would work out when experienced on-ride. Anyway, a pair of goslings have been added, with one looking rather spiteful. 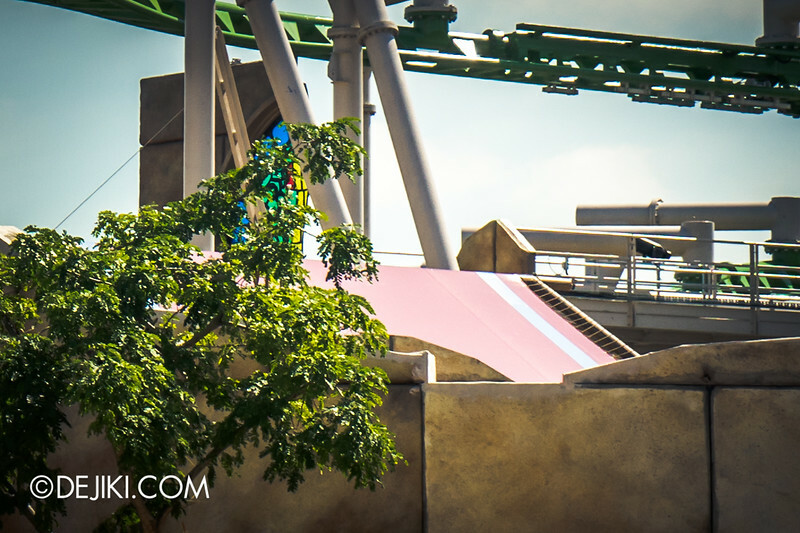 There’s also this tent-like structure – the ride vehicle might go through, or go pass it. 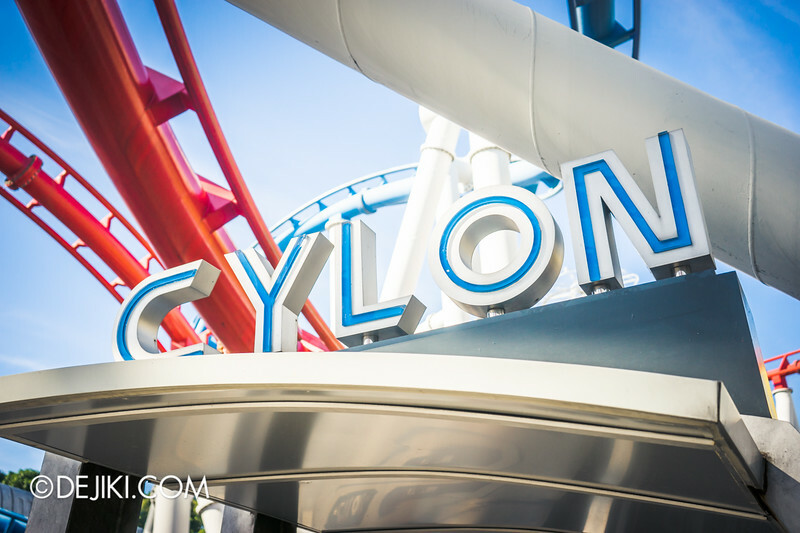 Battlestar Galactica is still undergoing tests. 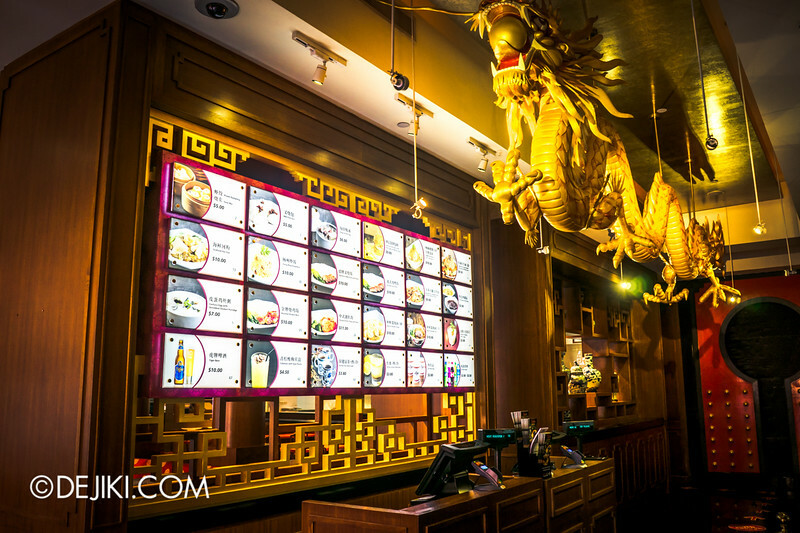 Yes, it’s 2015 now – but the reopening date is still a mystery. 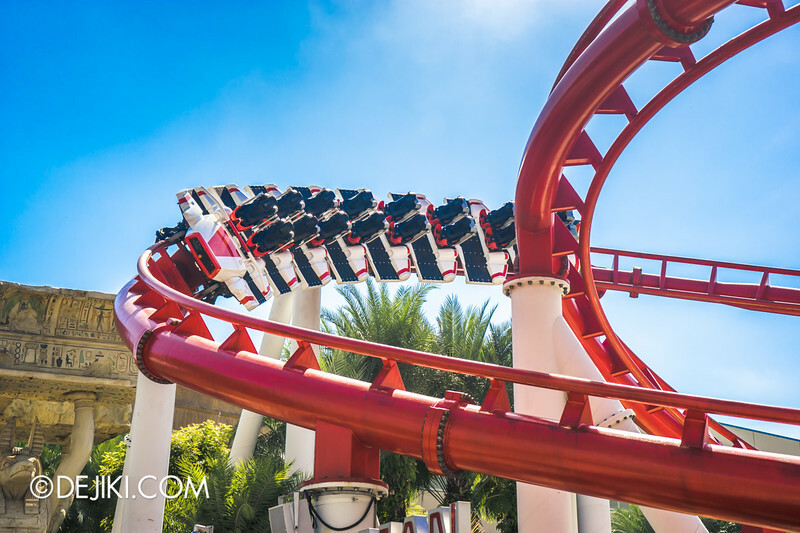 One thing is for sure – the park wants it reopened as much as every guest. Hang in there – marching orders are coming. 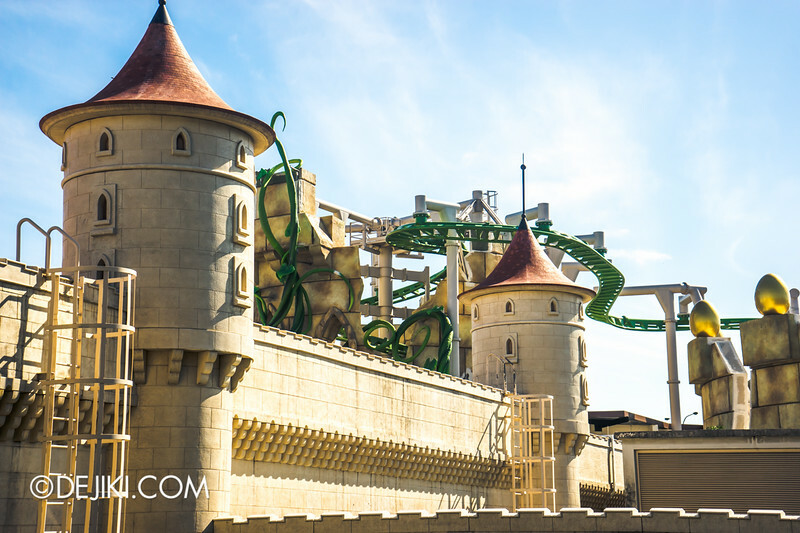 A few friends have told me that the roller coasters are testing at a much higher speed… sometimes. Perhaps the park is fine-tuning. It’s not just about making the trains go faster, as it would affect the way both ride vehicles duel, and of course, the length of the ride experience. 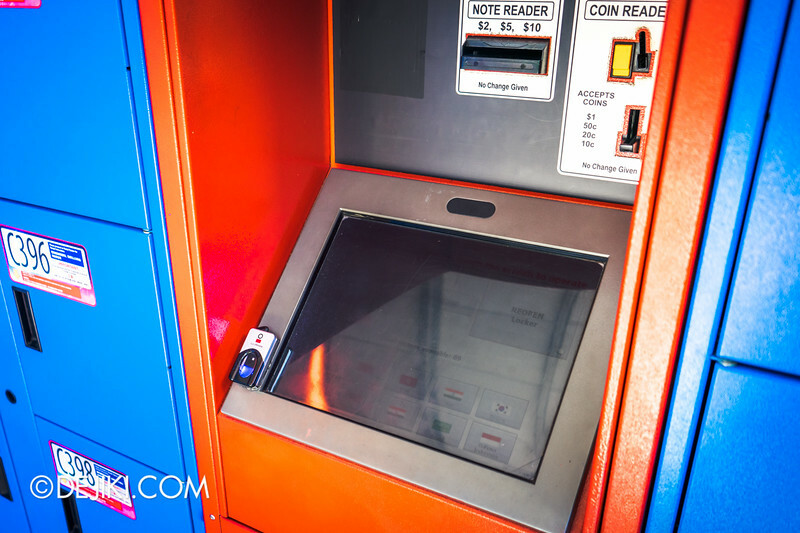 The lockers at Battlestar Galactica were recently upgraded with fingerprint scanners. 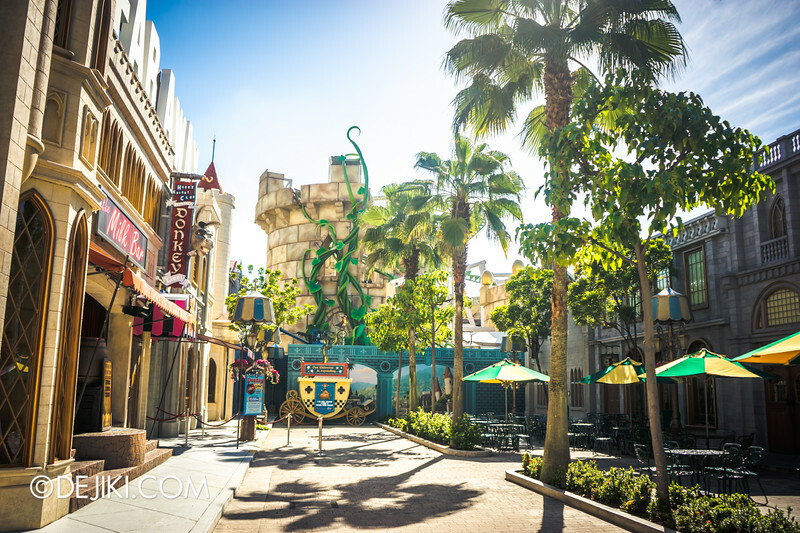 Last August, a similar upgrade was done at Revenge of the Mummy. Were there always so many nets at The Accelerator? 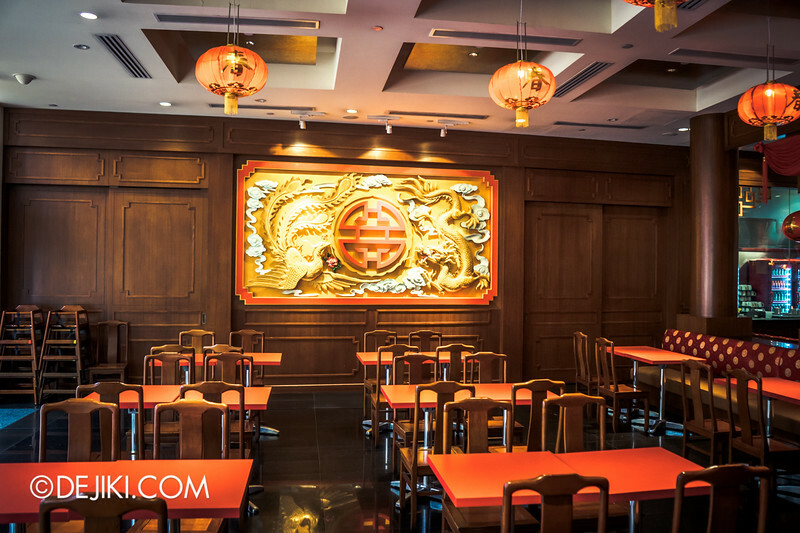 Recently, the Hollywood China Bistro has been revamped from a table service restaurant to a quick service eatery. 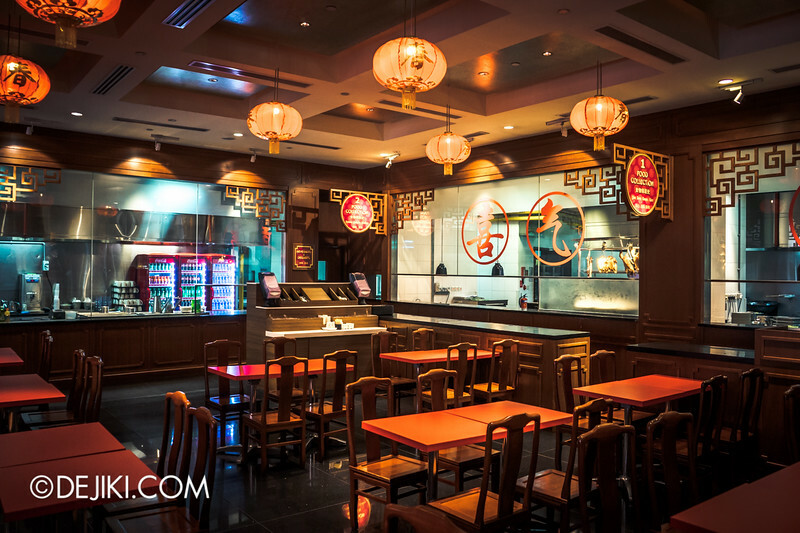 With this change, KT’s Grill remains the only Table Service restaurant at the park. Here are some highlights of the new menu. Place an order here, and collect it from the counters. What’s Out: Fancy banquet tables, wait staff and other luxurious bells and whistles. What’s In: Cutlery stations, ez-wipe-clean tables and a do-it-yourself attitude. At least the wooden chairs got to stay. The bar is still intact, it seems. The restaurant may no longer have the splendor it did before, but it’s better to have more people dining here than a fancy, deserted venue when the park gets very crowded. 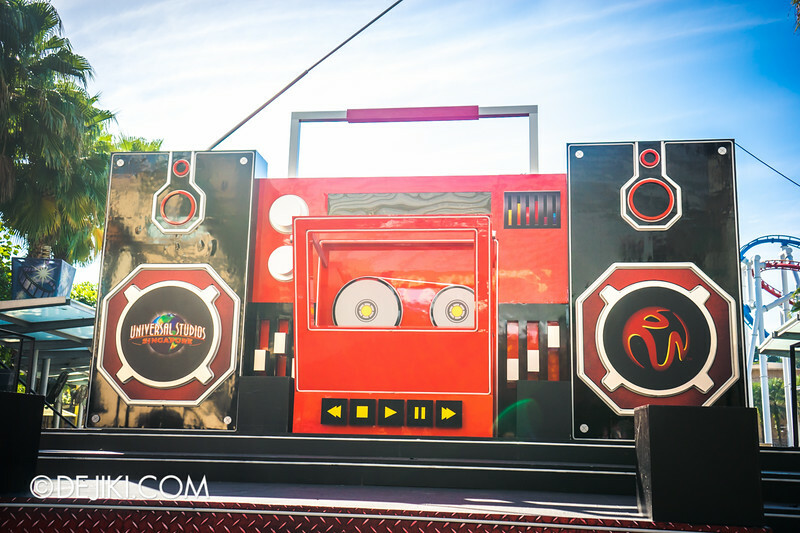 The Giant Boombox sets the stage at the Dance in the Park countdown party. Were you there? Post a comment and let us know how your night went! 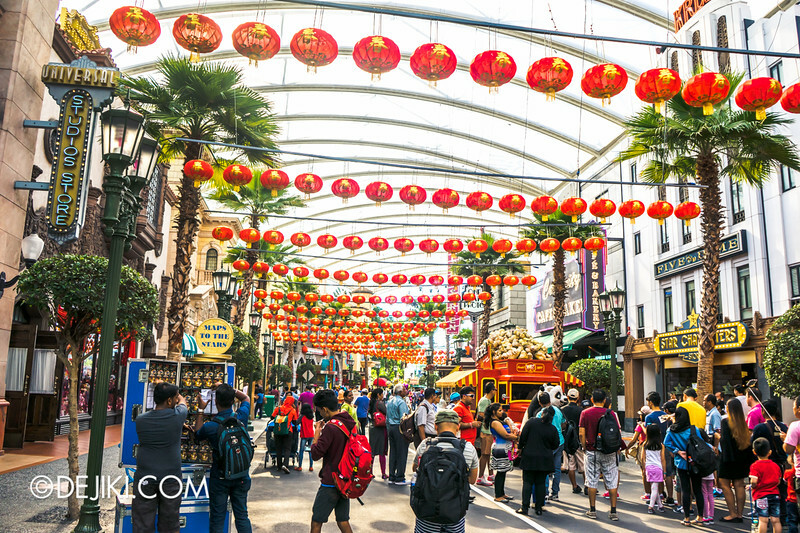 For 2015’s Lunar New Year (Chinese New Year) season, several rows of lanterns hang high above Hollywood and New York. If you remember (or check last year’s update on this), there were similar red lanterns with a horse motif in 2014. This year, there are much more lanterns, and they carry a different design. 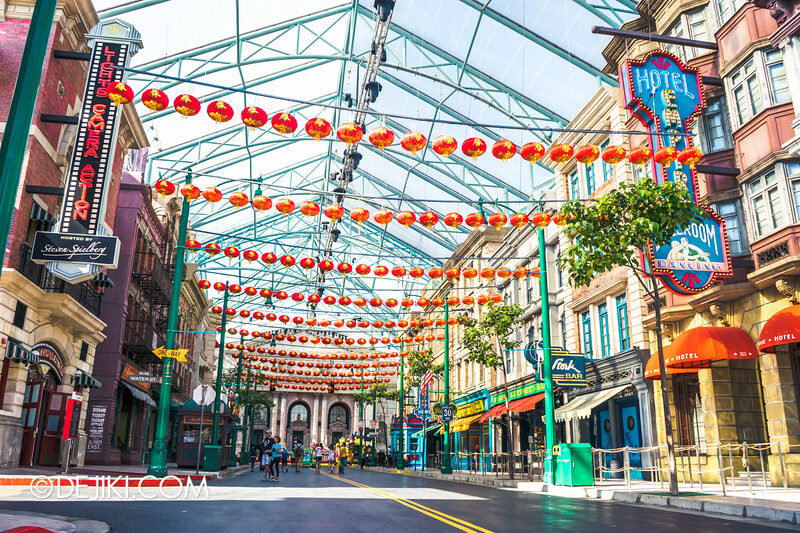 Very soon, park characters will be roaming the park in lunar new year outfits. And then the blasting of festive music – the one thing that should be feared. It’s time for this season’s Hollywood Store Window Update™. Check out the display that’s burst with red with a dressing of pink blossoms. Last year’s windows were so tame. 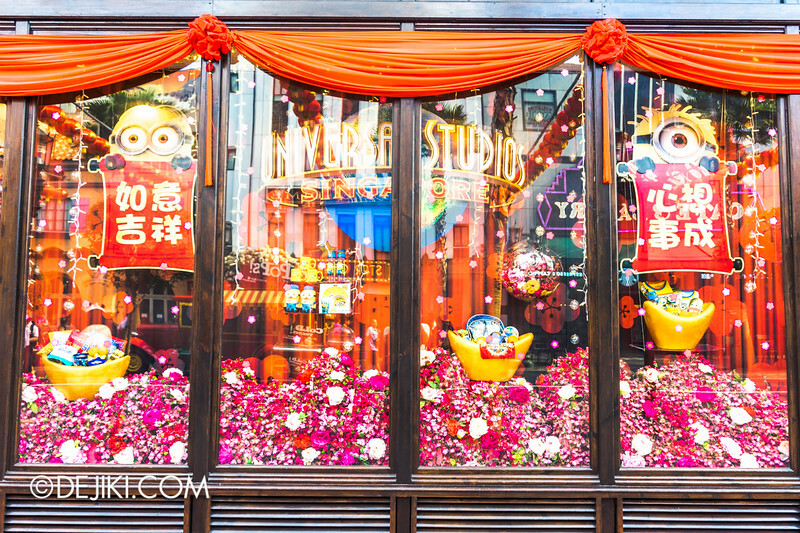 Minions grace the windows this season – they kinda look like pineapple heads anyway. All the gold (or yellow) things you need. 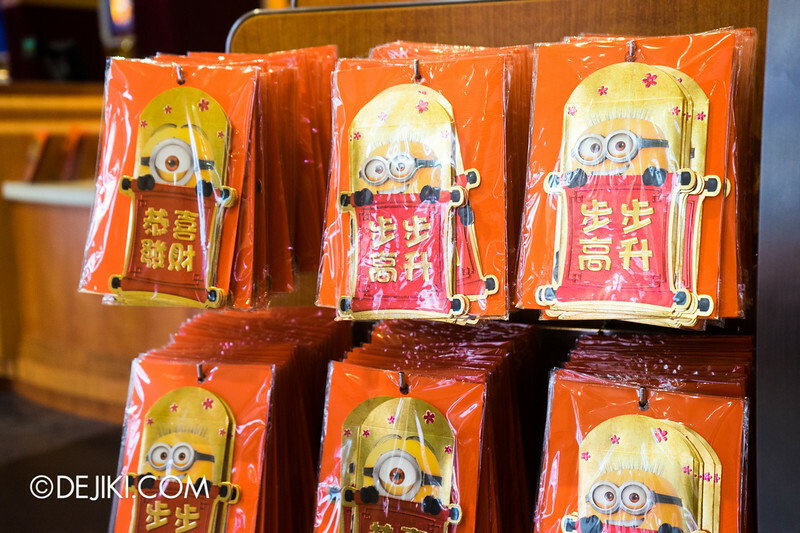 The park has Despicable Me Minion hong bao (red packets) this year. 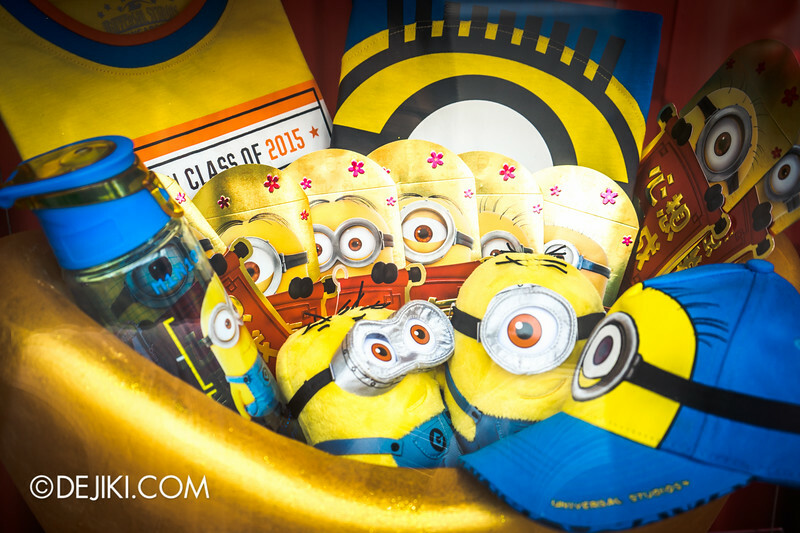 More like gold packets, each set (S$8) would give you 6 different designs featuring these two minions. 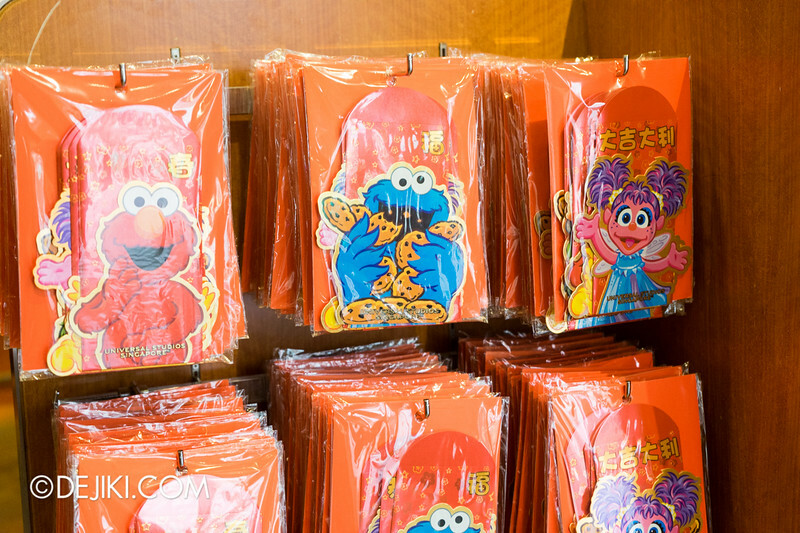 The Sesame Street hong baos are still available for sale – at a discount, because it’s so 2014. S$6 for the set of six. 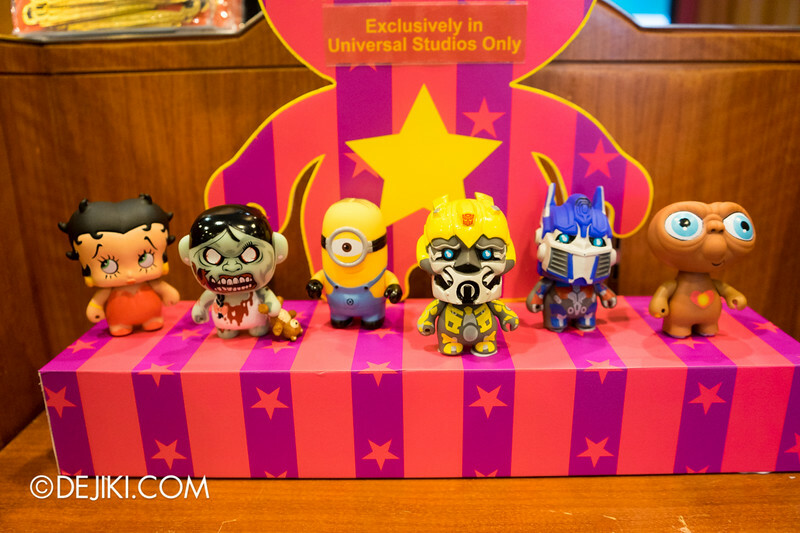 Meet the Uni-Minis collectibles: The Vinylmation/Funko POP-like toys by Universal Studios. The Zombie Girl has been around since Halloween Horror Nights 4. You can buy more and collect them all now – and hope that they can all be friends with your Funko Pop toys. 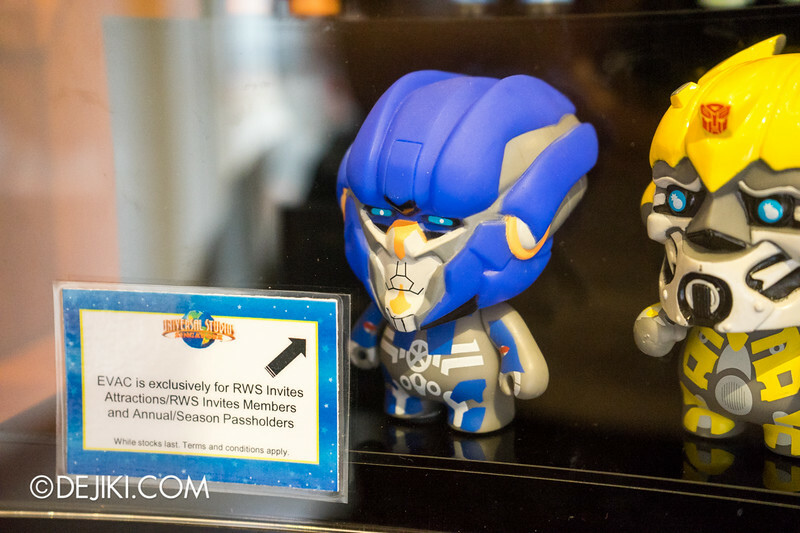 There’s a special one – the EVAC Uni-Mini which is a limited edition for sale to the park’s passholders only. All these Uni-Mini toys go for S$16.90 each. 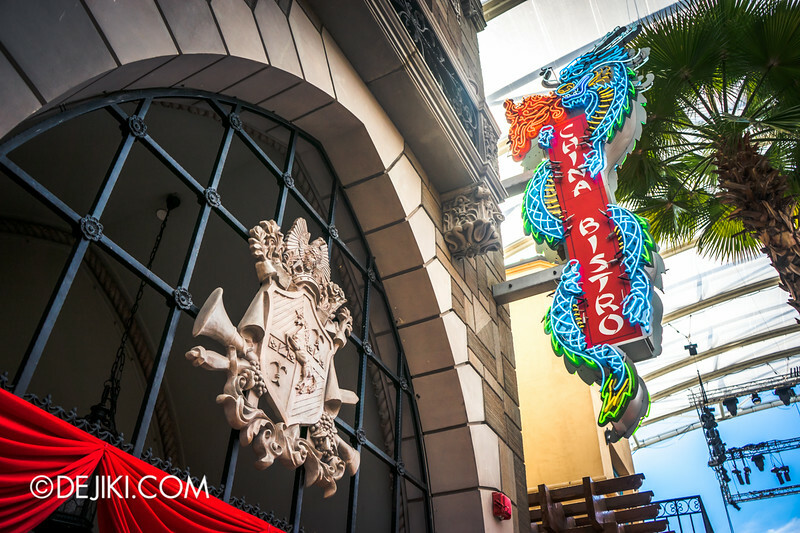 Check back next month for more photos of the Lunar New Year seasonal overlay at Universal Studios Singapore! Another nice update! The minions ang baos r sooo cute! In the rws invites magazine, there’s a feature on the new puss in boots coaster and what seems to be the ride vehicle can be seen in the article! Was hoping to be a flying coaster though. I am very excited about the Puss in Boots coaster. Hi dejiki. I’m curious about the concept art for Puss In Boots Giant Journey. 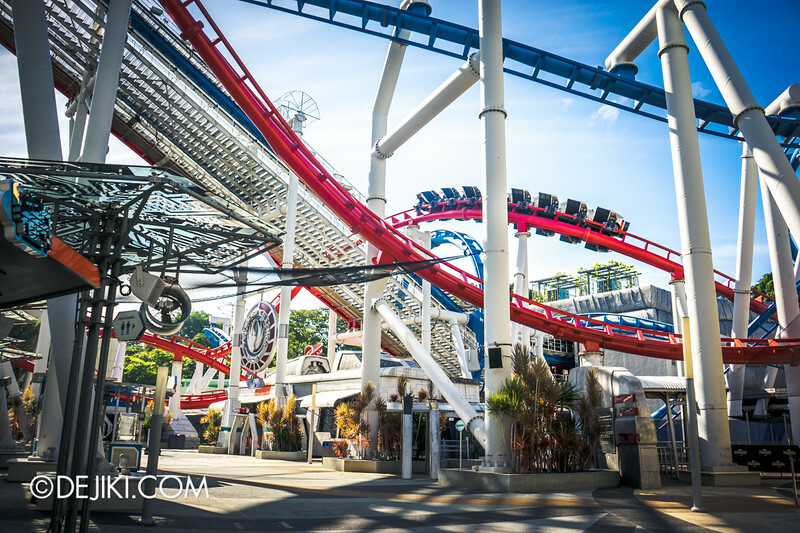 Been reading all your blog at USS and can’t wait for the exciting post of the reopening of BSG. Thanks! When will the Woodpeckers and other characters start donning their CNY outfits? I went to the park yesterday (17/1/2015) and the CNY-themed music was playing in the Hollywood zone but the Woodpeckers were still in their regular outfits. On the subject of characters, lately I’ve seen Shrek and Fiona meet at the Swamp House and I think that’s brilliant! I think they might have already done meets there for a while, but this is the first time I’ve seen that since the park’s early days! 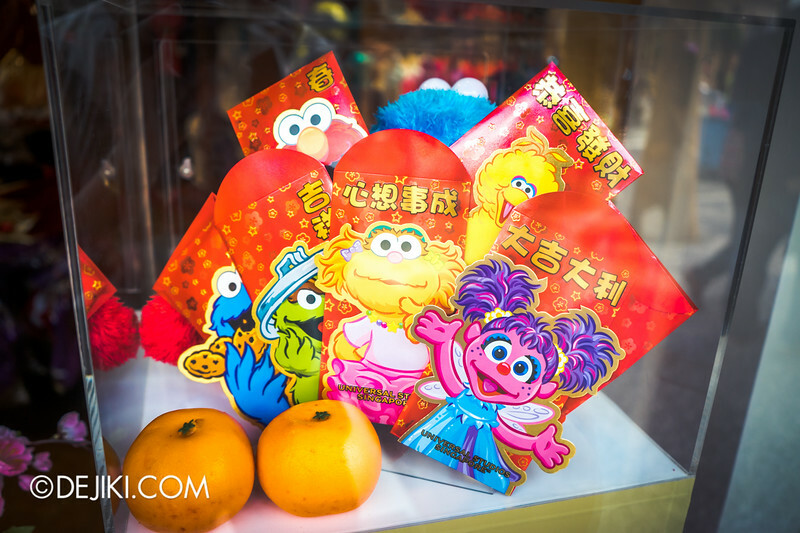 Also, is there anything special in the park lined up for CNY 2015? Thanks also for covering the Uni-Minis. I got the Betty Boop and Evac ones yesterday and they look great! Great post, and thanks for your constant updates on USS. Would just like to clarify that the Giant Boombox was not part countdown party in USS; they were still using the Christmas deco during the countdown. It was actually used as part of another event that occurred during January. Kudos, and keep it up with the updates! Looking forward to February’s post full of festive delight!